There are a few different causes of tooth pain — and just describing your ache can give your Huntsville dentist a good idea of what’s causing it. 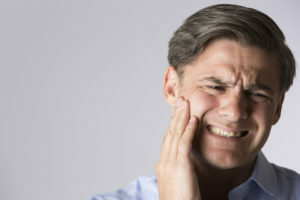 You’ll need an exam and possibly X-rays to find out for sure what’s at the root of a toothache, but we go into more detail about the different types of aches and pains that can occur below. No matter what’s causing the pain, don’t wait to schedule an appointment to get it taken care of ASAP! Is Your Toothache Like This? Sensitivity to hot and cold foods or beverages: This momentary pain does not usually indicate a serious problem, but it may if it lasts for a long time. Tooth sensitivity can be caused by weak enamel, gum recession, or something else. You may want to try brushing your teeth with an anti-sensitivity toothpaste — if that doesn’t help, see your dentist soon. Sharp pain when you bite down on something: This is something you’ll notice, and the quick flash of pain will probably take you by (unpleasant) surprise. If you experience pain when you bite down on food, you may have a cavity, a loose filling, a fractured tooth, or a crack in the tooth. Severe pain or pressure: This type of toothache may be accompanied by gum swelling or sensitivity to touch. You should schedule an appointment with your dentist right away, as this may indicate an abscessed tooth that requires immediate treatment. A dull ache in the teeth, jaw, or a persistent headache: This type of pain may seem like something you can live with, but a visit to your dentist may result in a diagnosis for bruxism — or nighttime teeth grinding. A customized mouthguard can help to cushion the tooth enamel from this damaging (and painful) habit. Healthy teeth should not hurt. If you experience any type of tooth pain, it is important that you see a professional right away. This is especially important for a severe toothache, as an abscessed tooth can quickly cause problems with your overall health. When you come into our office with a toothache, we will evaluate the situation and ensure that you receive the treatment you need as soon as possible. An emergency root canal, for example, can rescue a severely damaged tooth and quickly get you out of pain. The next time you or a loved one experience a toothache in Huntsville, don’t wait to get in touch with a professional. Doing so will protect your oral and overall health — and could save your smile in the process! Dr. Deborah S. Bishop is an endodontist specializing in tooth pain. To learn more about what might be causing yours — or how Dr. Bishop can help solve it — we invite you to contact the office by calling 256-882-5161 today!